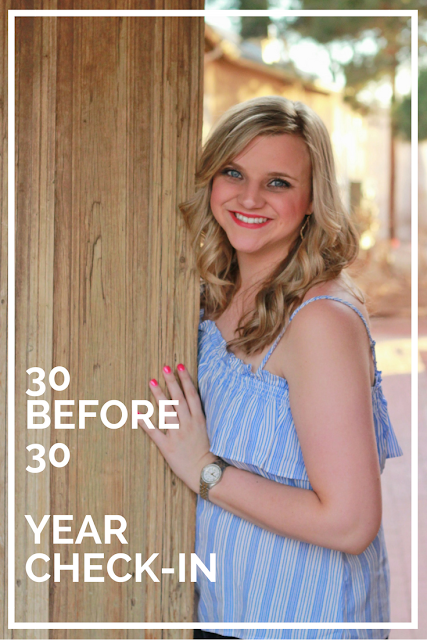 Last year I made a 30 before 30 list. Originally I had intended to do a 28 in 28 list but I figured that would be too much pressure so I wanted to give myself two years to complete some of the things that I had come up with! So far I've done....horribly. I literally have only completed like 5 things. Major fail. I feel like I should have completed at least half of them while I was 28. Because now I feel like I have quite a bit to get through in the next year. Plus, as I'm looking at some of these I'm not really sure what I was thinking. Because a year in, there are few things that I want to take out and/or change. But I think I'll just stick with my list and make it more of a priority in the next year! Let's see what I have done shall we?! 1. Go to Washington D.C. Woo hoo! This was accomplished last summer. And it was fantastic. 2. Go to Europe again. This will be happening in March of 2018. I'm pretty certain I'l actually be IN Europe when I turn 30. 3. Live in and decorate my own apartment. Check! And let me tell you, it is the best! 4. Go on another cruise. This is happening this June! And I've already started paying for it and bought my plane ticket so I'm checking it off! 5. Run a 5K or some other type of race. 6. Try online dating again. I've joined Match and have been on a few date, none of which have lead to anything. It's been really depressing actually. 7. Reach 1,000 Instagram followers. I'm currently at 826 and I totally think I can make it to 1,000 in a year! 8. Get the domain I purchased to actually work with my blog and eventually re-design the blog again. YES! I finally got a domain to work! I'm officially www.placesiwillgo.com I'm hoping to re-design the blog sometime soon. 9. Read 200 books - 100 for each year I have left till 30. I'm not sure this gonna happen. But I'm gonna sure try. 10. See a Broadway or Broadway type play. 11. Take a photography class. I'm actually taking one this Sunday! The best part is that it's specifically for bloggers so I'm super excited! 12. Make photography a side business. 14. Go back to Universal Studios and see Diagon Alley. BAH! I just got wind that this is probably happening when I'm in Florida in June! I'm pretty much freaking out about it to be honest. 15. Apply for the Fund for Teachers travel grant. I'm not sure this is something I want to do anymore. 16. Be healthier- possibly go down a jean size or two. I'm not sure where I'm at one this one. I don't even own a scale. I do know that I'm still the same jean size as I was when I wrote this list, so that's good I suppose. If only because it means I haven't gained any thing. 17. Buy a clothing item full price from Anthropology. 18. Pay off remaining my credit card debt. I've started this too! So fingers crossed by the time I'm 30 it's a nice chunk of change. I was supposed to be going to Chicago this summer, sadly it doesn't look like that is going to be happening anymore. But I'm hoping to do a long weekend in either Seattle or Boston instead. I've decided to add Charleston as an option here too! 21. Meet my future husband. Nope. Well see how this year goes. 22. Take a (or preferably multiple) workout class - Zumba, Pure Barre, Spin....something! 23. Attend another blog conference. Sadly I couldn't attend Thrive this year, but I'm really hoping to be able to attend next year! This was another one that almost happened this year but didn't. My mom really wanted to go over Spring Break but we ended up staying home. We've been talking about going in December though! 26. Learn to do my hair in an up-do. 27. Learn to like wearing high heels. Accomplished. Now ask me if I actually wear them that often and the answer is no. But when I do I actually like it! 28. Eat in a restaurant by myself. 29. Send close friends and family birthday cards starting this summer. Ok so maybe starting next week, rather than last summer. I've already got my first one ready to go! 30. Go to the Houston rodeo. This was supposed to happen this year and sadly it did not. Next year for sho! I've left a few blank with no update or anything because those are the ones I had forgotten about. I think I need to write this list in my planner and have a note in my phone so I'm more aware of it. I am really glad I gave myself until I was 30 to accomplish these because clearly if this had been a 28 in 28 I would have failed HORRIBLY! But I am excited to have something to accomplish in the next year. Gives me something to work towards and that is always a good thing! You have such a fun list and I definitely wouldn't look at only crossing off a few things as a bad start because they were such huge things! I can't wait to see what you're able to check off this next year. You've gotten a good start on your list! You have some amazing things on your list, too. I love that eating in a restaurant by yourself is on your list - I think that is one of the ultimate things for self-confidence. I'm also super jealous you'll be in Europe on your 30th birthday. I went in college and I have been dying to go back for years. One day! I see that living healthier is on your list. This is actually my specialty and I'd love to chat with you about it. I'm a teacher and mom so I focus on working with busy girls who struggle with the time it takes to get to the gym or do complicated meal prep. I'd love to have you if you are interested. I feel like you've still got a lot of things crossed off your list and you still have the ability to get a lot more things done before next year! I was just looking at my 101 in 1001 list, and I have a feeling that there are a few items on my list that probably won't get done. At the end of the day it's about pushing yourself to find new things, and I think that's what you're doing! These are great goals!! I actually enjoy eating in a restaurant along sometimes. It's very peaceful! I had to giggle at Michael Buble because Trav always brings up how people say he looks like him (he does not). I like eating alone in a restaurant especially breakfast! I feel like you will end up getting most of these done! I'm hoping Michael goes back on tour too. Can understand though with his oldest not doing well. This is such a great list!! Love this idea! Kind of like a bucket list. I definitely need to add some of these to my list! europe when you turn 30, how amazing!! i did horribly on my 30x30 but only because i started to realise certain things weren't that important or i didn't really want to do them. and that's okay too. i have seen michael buble twice - he had 4 shows in sydney and i went to 2 of them - and he was amazing.